Happy Friday, everyone! We made it home from the Bahamas very late last night, and I am up and running out the door early today. I am shooting with my Chic at Every Age girls then separately a bit later today to try and catch up. I’m pretty confident that we are going to have a very low key weekend after our trip. I can already tell you that I am missing the beach view this morning! 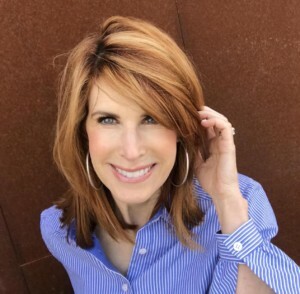 Today, however, I am so excited to be partnering with Walmart, and their “We Dress America” campaign to show you some great fashionable pieces! 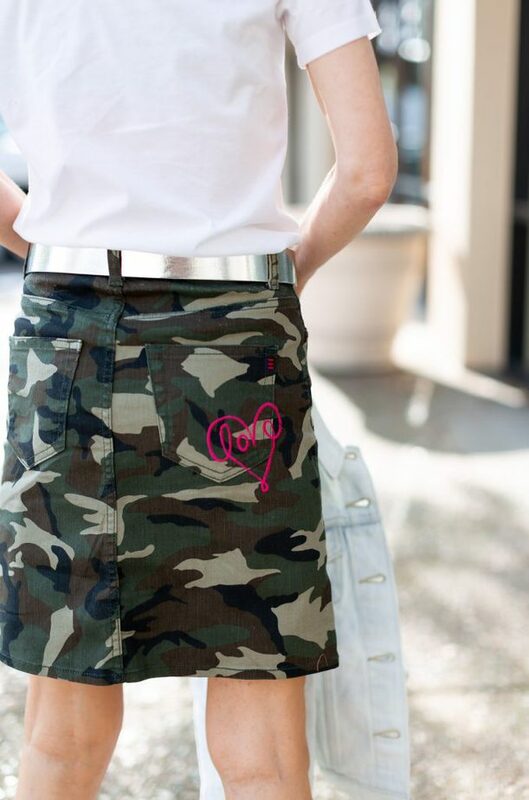 I thought this EV1 by Ellen DeGeneres camo print skirt was so stinking cute. I love camo and usually pair it with white, black, or grey. 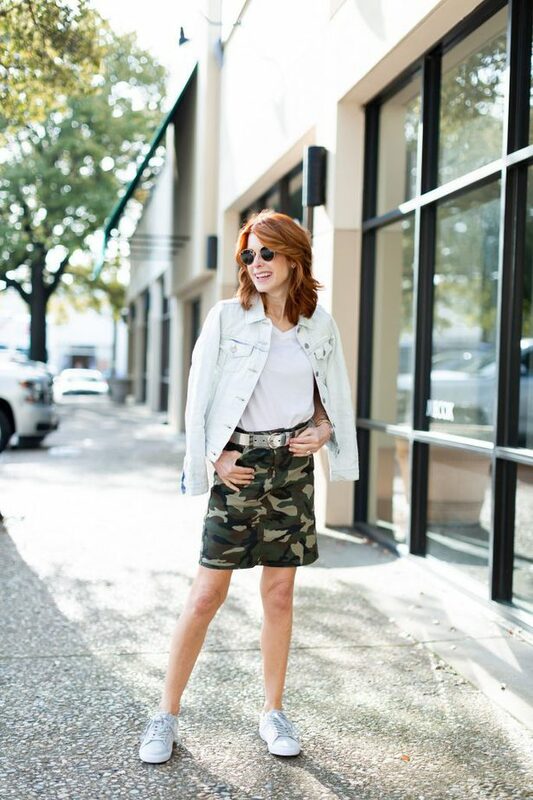 This skirt is the perfect length for me for Summer, and the fit was perfect (how cute is this camo shirt too?)! EV1 by Ellen DeGeneres pieces come in a large range of sizes to fit most everyone. 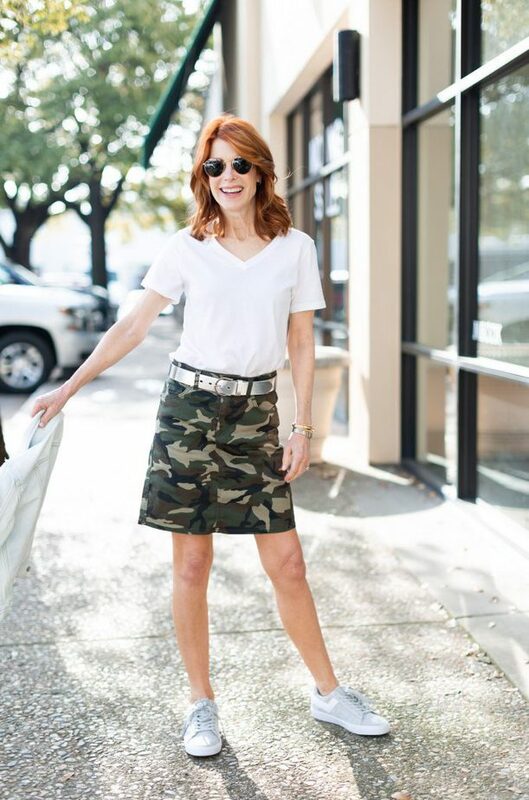 If this camo skirt doesn’t float your boat, then maybe this flippy ruffled one will! I found this white Time and Tru v-neck tee ($5.00) and I promise it is every bit as soft and durable as my expensive white tees. I am ordering about five more because white tees get so dingy after wearing them over and over. The tee also comes in other colors as well. I also snapped up the denim jacket I am wearing because I didn’t have a light one. 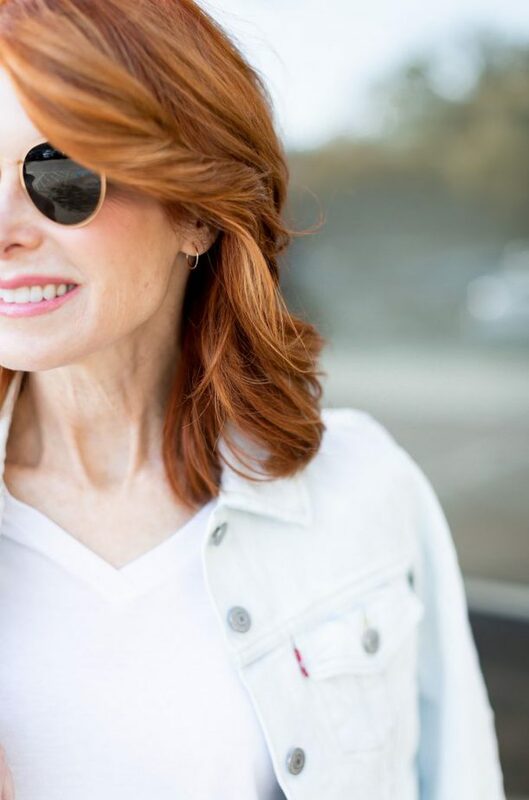 It is the perfect denim jacket for Summer! Not only can you find great fashion pieces at Walmart but great accessories too! 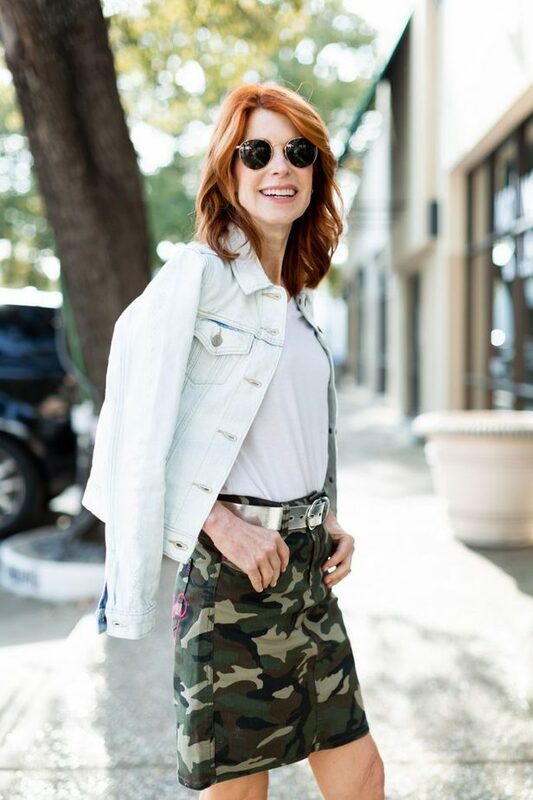 I wanted to zhush up the look I am showing and found this simple (but fun) silver belt (it is sold out but this is a good one too). This belt will be worn with all of my jeans this Spring and Summer. I am also getting ready to order this belt that looks very similar to a very expensive one I saw in a boutique the other day. I am obsessed with the 14k rose gold baby hoops I am wearing. They are so dainty, very reasonable and will go with anything you are wearing. Next on my list is this 14k gold cross. I never knew that Walmart had great “fine” jewelry too! I love that sneakers are acceptable to wear with skirts and dresses. I found this grey pair in suede and thought I could wear them with so many things (another great pair here). Comfort is key and these are very comfortable! I think my outfit would also look so cute with these wedges. I had so much fun perusing the Walmart website and finding great products at amazing prices. I don’t talk about home products very often (even though I love them as much as I love fashion) but I had to let you in on Drew Barrymore’s Flower Home line at Walmart. It’s about the cutest stuff I’ve ever seen! I want this set of dinnerware and this dog bed (for the dog I don’t have but am going to get!). There are so many cute products! Stay tuned for another post to come featuring what might be my favorite jeans of the moment! Thank you, Walmart, for sponsoring this post! Share the post "WALMART // “WE DRESS AMERICA”"
Great post! I too never imagined Walmart would have great options for clothing! I didn’t realize that EV1 was in Walmart. I’m checking out Ellen’s whole line right now!